There are some moments in history that the world looks back on with a sense of awe, and Serpom Monastery’s grand opening is set to become one of them. 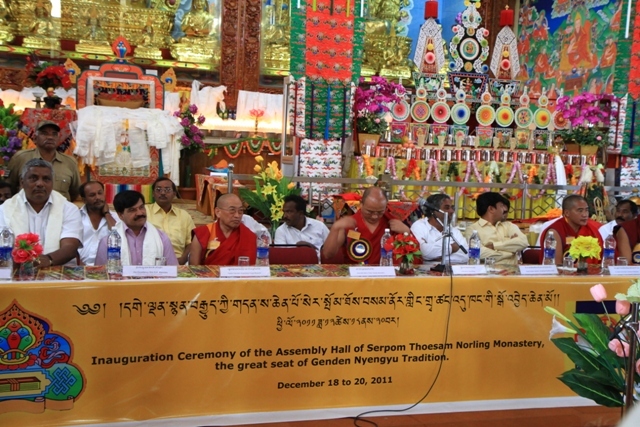 This auspicious occasion was more than any other monastery opening. 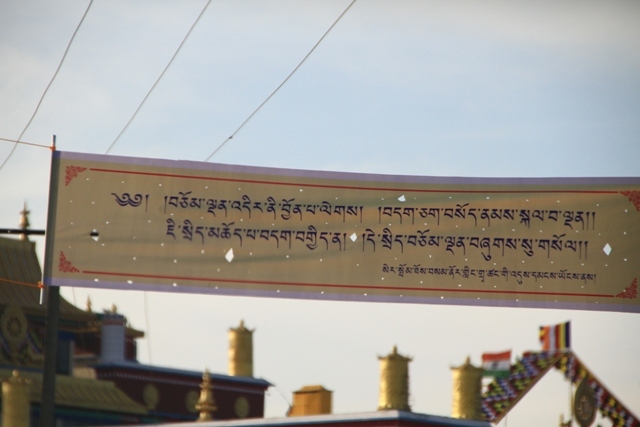 It was an inspirational reminder that despite the dark and difficult times for Shugden practitioners, there are still people with deep faith who will follow in Duldzin Drakpa Gyeltsen’s footsteps to open new monasteries and propagate Tsongkhapa’s tradition. 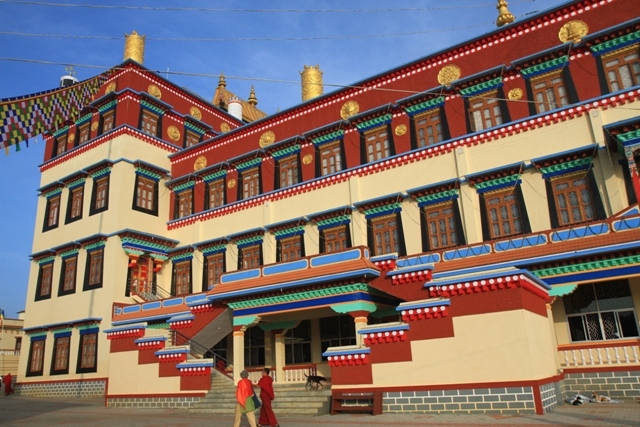 Based in South India, Serpom Monastery is the home and school for 600 devoted students of the unbroken Gaden lineage. With its strict academic and spiritual curriculum, this monastic community has produced hundreds of elite scholars over the years. 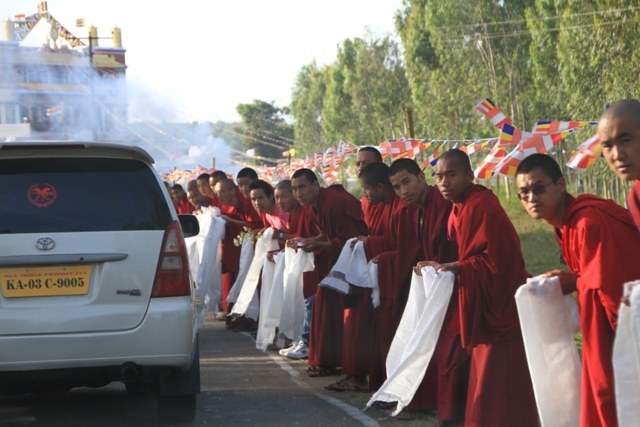 Thus clutching our precious invitations to the opening, it was with a great deal of excitement and anxiety that a group of us packed and left for India on 15 December 2011, just a few days away from the upcoming Lama Tsongkhapa Day celebration. Landing in Bangalore on a cool winter’s morning, we were greeted with the smell of Indian spices and masala tea, and a convoy of cars to take us and other pilgrims to Bylakuppe. It was a journey of spectacular countryside views and green fields of hardworking farmers toiling for their livelihoods. It was difficult to imagine that this starkly beautiful place is the epicenter of a ban that has caused millions to suffer and has torn apart the Buddhist community. After six hours of coffee, bumpy roads and irrepressible picture-taking, our group finally caught a glimpse of one of the world’s most controversial (and influential!) monasteries. 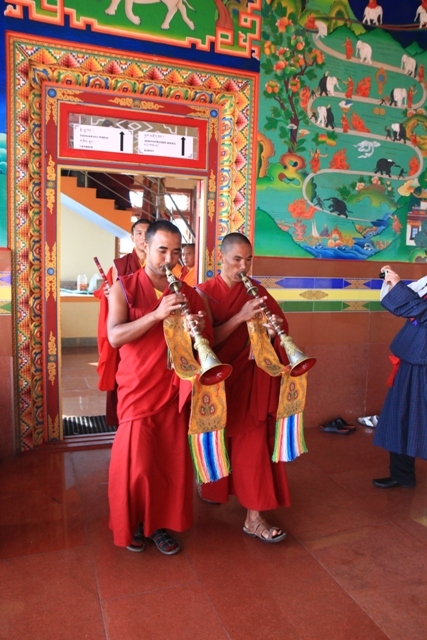 The sound of long horns travelled into the clear blue sky, chased by the sound of clarinets and cymbals played by monks in the most respectful manner. 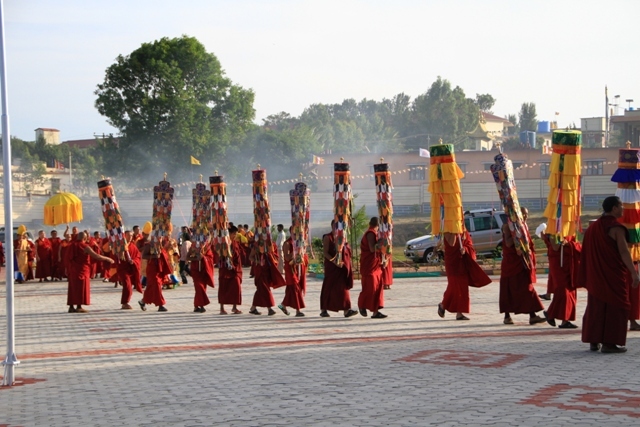 A golden parasol had been prepared to welcome the abbot of Serpom Monastery, His Eminence Yongyal Rinpoche. A man radiating compassion and pure guru devotion, Yongyal Rinpoche was recognized by HH Trijang Dorjechang as the fourth of his line of incarnations. In this incarnation, Yongyal Rinpoche has been an inspiration to Dorje Shugden practitioners everywhere, as a monk who persevered in his faith and practice, and has held on to his vows despite the ban. 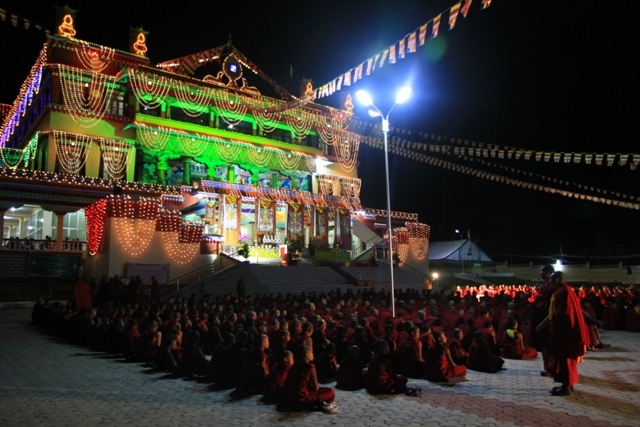 It must have brought tears of joy to Yongyal Rinpoche’s eyes to lay eyes on Serpom and watch the years of hard work and struggle culminate in the establishment of a monastic institution. 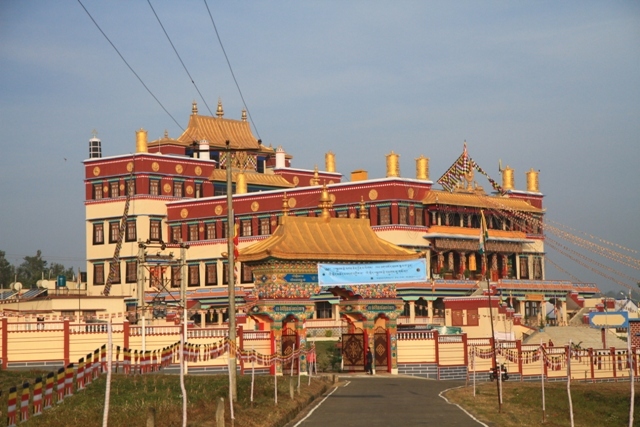 In fact, Serpom Monastery is more than just any other monastery – because it arose at a time when the sangha community have become segregated, Serpom Monastery is proof that unity and harmony are key to reviving the Buddhadharma in this Kaliyuga age. His Eminence then graced and blessed the main prayer hall (gompa) for the very first time, alongside thousands of monks he led into the gompa. 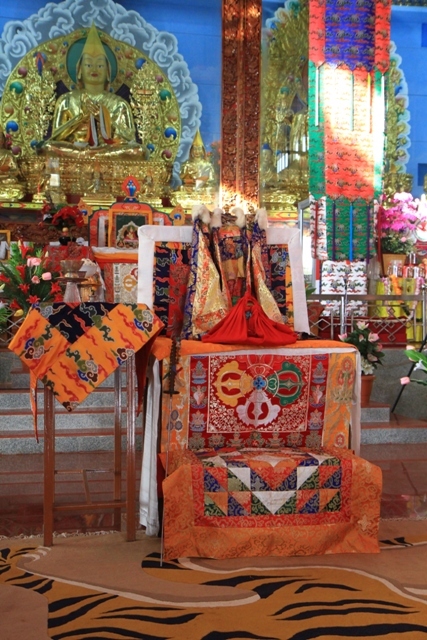 For those of us who were visiting a Tibetan monastery for the first time, the experience could not have been more authentic – no expense had been spared on the gompa, with a stunning altar as the focal point. 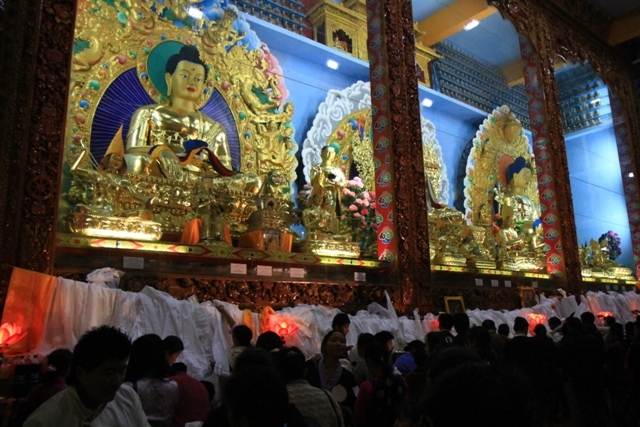 The altar was made all the grander with large statues of the founder of our lineage Lama Tsongkhapa in the middle, Buddha Shakyamuni on the left and Medicine Buddha on the right. 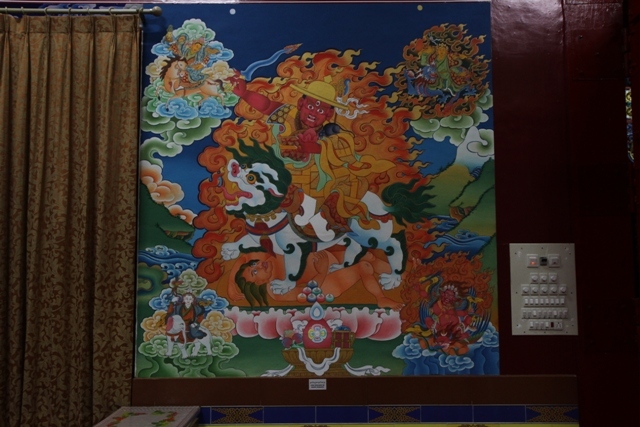 The monks lined up and made offerings to the images, as Yongyal Rinpoche entered a small room which we guessed to be a chapel for our precious protector Dorje Shugden. It was an exciting moment – who would have thought that in the midst of the ban, Dorje Shugden’s practice continues to grow. 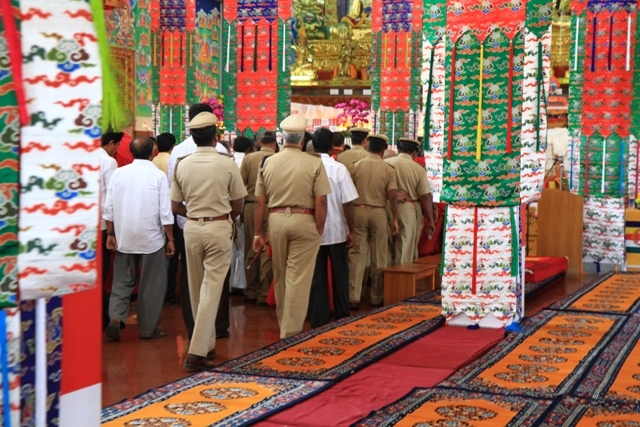 In fact the whole opening ceremony was planned over five days, from 18th December until 22nd December 2011 with commentaries and teachings, debate sessions, food, prayers and speeches from dignitaries to celebrate this auspicious occasion. The most highly anticipated event however, was the planned trance-taking session when the King himself would enter the Oracle, and come to bless the monastery that would preserve and spread his practice. Never in our lives had we had the chance to meet the King himself, so it was definitely high on our to-do list in this spiritual journey! The days flew by and before we knew it, it was 18th December 2011. At exactly 6am, with our eyes filled with sleep but our bodies trembling with anticipation, we joined thousands of other devotees to witness Buddhist history being made. 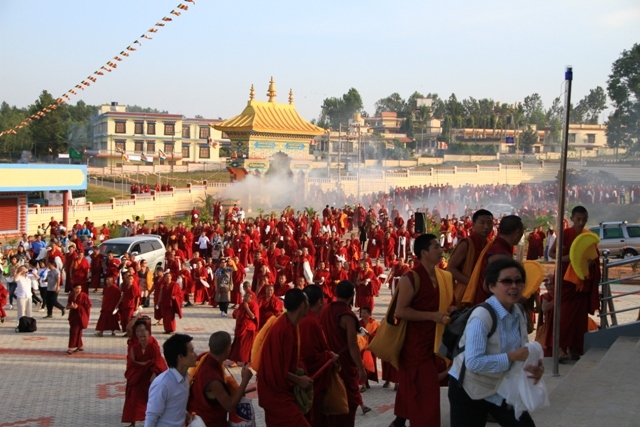 Thousands of monks young and old congregated for the main opening ceremony; squeezed in to the gompa were high lamas, tulkus, Geshes, abbots and lamas from different monasteries and countries. 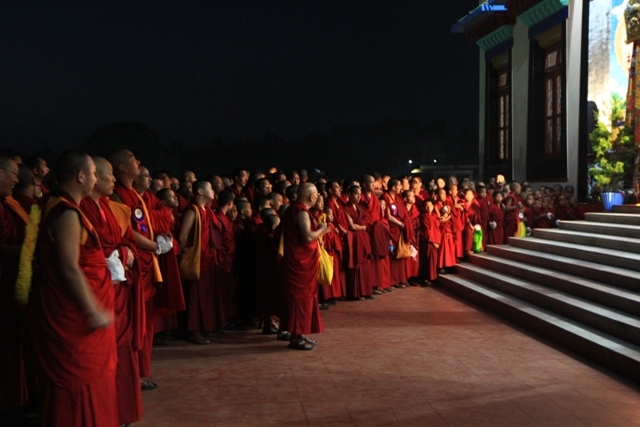 Joining them were guests and sponsors from Taiwan, China, Tibet, America, France, Switzerland, Australia and Italy, all gathered for one reason – to spread the dharma. 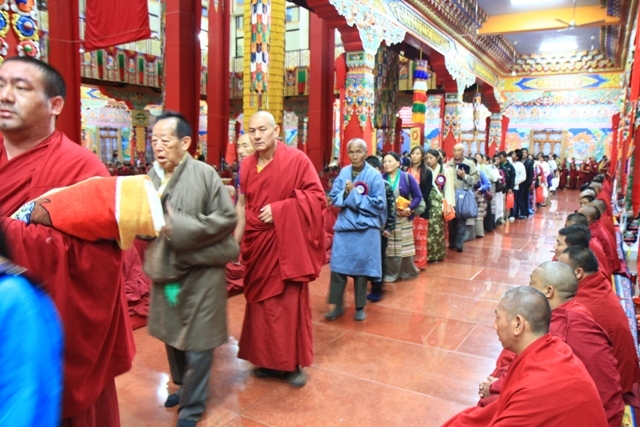 Of course His Eminence Khen Rinpoche was also there, to cut the ribbon and lead the monks into the prayer hall for a puja that would bless the gompa. As the puja started, you cannot imagine how excited we were to witness the very first spiritual activity being conducted in the monastery. But that was not to be the end of our day because in just two hours’ time, we were about to meeting the great King Dorje Shugden himself. And then it was time for the world renowned Chojela to take trance! 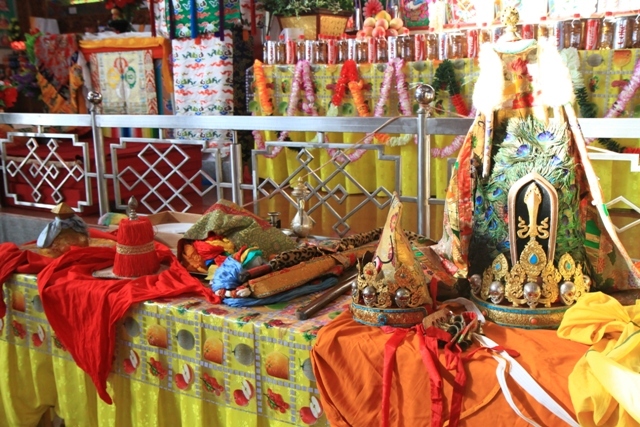 For the first time, we saw the beautiful setting of the Oracle throne and outfits, and the different hats for the deities; for the first time, we saw that in these modern times, the monastic institutions have not lost an inch of the traditional practices and authentic lineage that has been passed down for thousands of years. Heralded by the sonorous chants of monks reciting auspicious prayers, Chojela entered the room in his golden brocade robes. 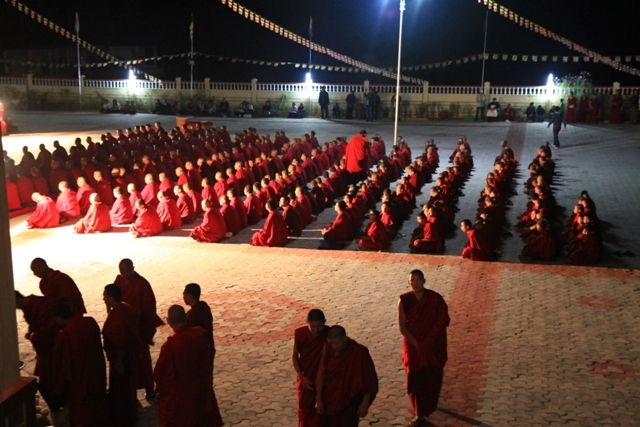 Thousands of attendees rose to make three prostrations to pay their respects for they were about to meet the King, who would enter an Oracle personally trained by His Holiness Dromo Geshe Rinpoche and His Holiness Kyabje Trijang Dorjechang. The room quickly filled with the smell of sang offerings as attendants moved forwards to assist Chojela in putting on the remainder of his outfit. It did not take long – the outfit went on, the chanting continued, a jerk, and the King had arrived in the Oracle. 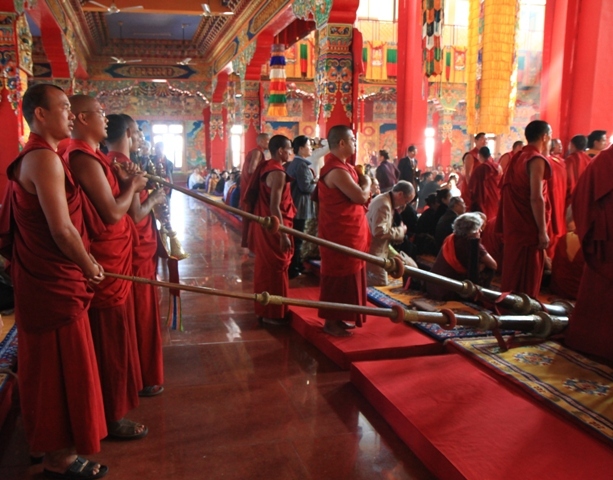 Holding his sword to perform a Vajra dance, Dorje Shugden then took his seat on the throne as all the high lamas, monks and guests lined up to pay their respects and receive a blessing. Leading them was Yongal Rinpoche, who stepped forwards first to make body, speech and mind offerings to Dorje Shugden himself. Then 15 minutes later, it was all over. 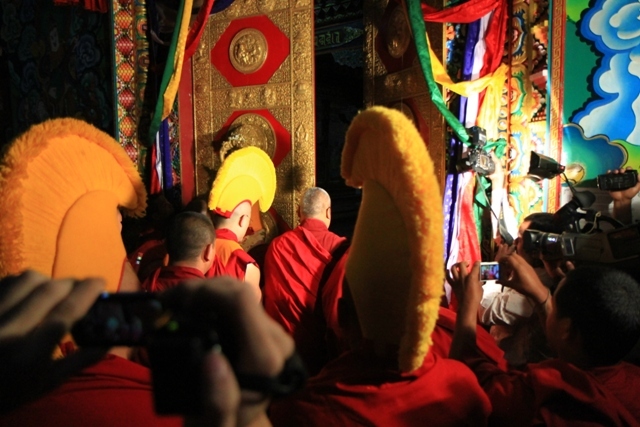 Dorje Shugden left, and the monk attendants surrounding the Oracle moved to change the Oracle’s hat, in anticipation of the arrival of the next wrathful Protector. With a shrill cry, it was clear to all when Lord Setrap had arrived. With a stamp of his spear to announce his arrival, Setrap did a Vajra dance before settling to bless the monks…if you can call it settling! Bursting with wrathful energy, Setrap jerked as he blessed the monks but five minutes later, the energy was too overwhelming for the Oracle’s body that compassionately, Setrap left. 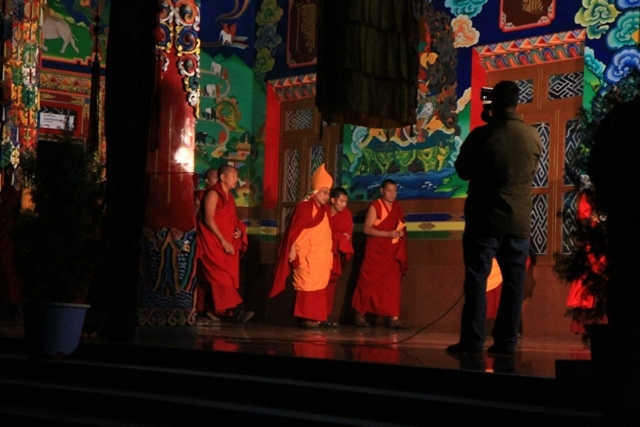 Again, the monk attendants moved to change hats and before we knew it, Protector #3 had arrived. Wearing a red tasseled hat, Chingkar Jowo, Serpom’s female Protector, was gentle and peaceful, and able to stay to bless the crowd one by one. It was something our group had never seen before, a female Protector so we felt very blessed to connect with her for the first time. When the monk attendants moved forwards for the final time, our group were almost bereft with excitement because we all knew who was coming next…Kache Marpo! 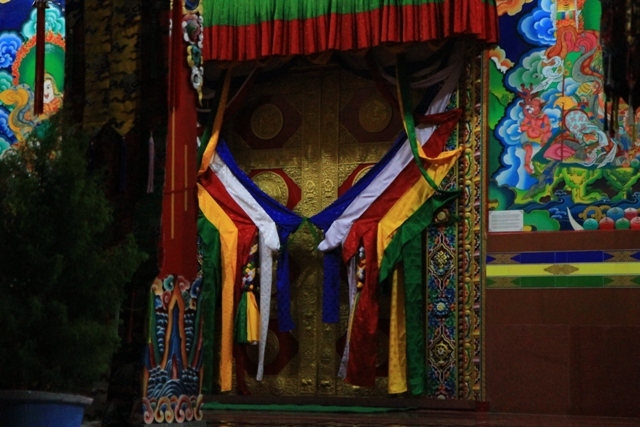 He entered the Oracle, remaining in the Oracle’s body almost imperceptibly as he walked over to Yongyal Rinpoche to pay his respects, before sitting on the throne to bless the crowd and give a Dharma talk. Even though it was in Tibetan, and none of us could understand a word, just to be in the presence of such holy beings was a true blessing. It was in itself unusual, to say the least, to receive a Dharma teaching from Kache Marpo – none of us had ever received a teaching from a Buddha himself, much less Hayagriva! Finally Kache Marpo left, and the electrifying energy that ran through the hall was gone. The whole trance had only lasted approximately 1 hour and 30 minutes, but it was the best hour and a half of our lives. Thousands of people had had the opportunity to meet four Protectors, including the King himself. It truly was a blessed session, every single minute of it. 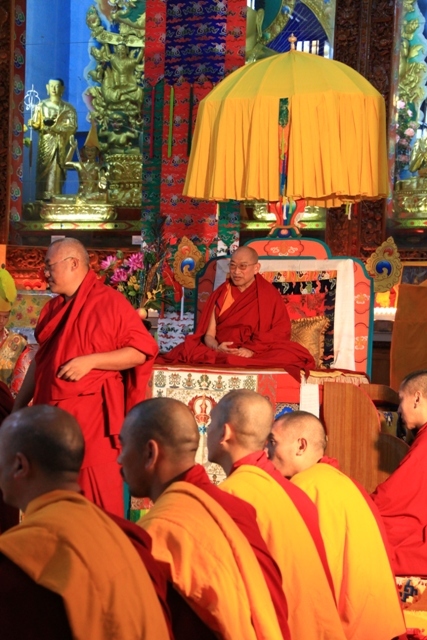 Later in the afternoon, there was an official speech giving ceremony by Lharampa Jampa Khetsun, monastic spiritual advisor followed by His Eminence Kyabje Yongyal Rinpoche. His Excellency S.A. Ramdas then spoke about integrating Dharma in our lives, regardless of whatever religion we are, to help us to have a more meaningful existence. He also said that Buddhism has existed in India since Buddha’s time, and we must continue the legacy as Buddha’s wish was to benefit all sentient beings regardless of what religion or sect they came from. It was a comfort for Dorje Shugden devotees to hear this voice of support from an Indian government official, as we continue to suffer because of the practice and sect we come from. 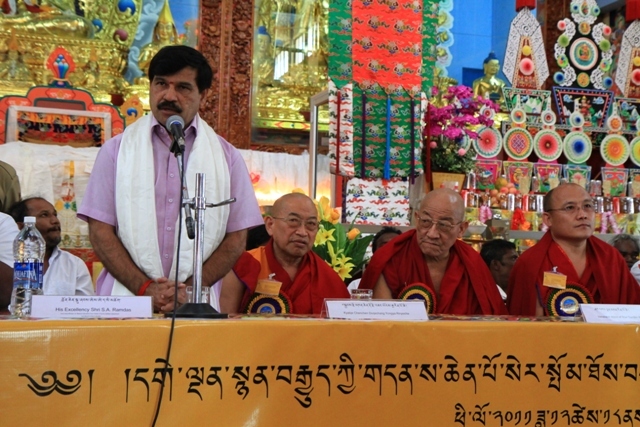 Honorable Karnataka Minister, Shri K. Venkatesh (Member of Legislative Assembly for the Periyapatna Constituency) also gave an inspirational speech followed by the Venerable Abbot of Shar Gaden Monastery. 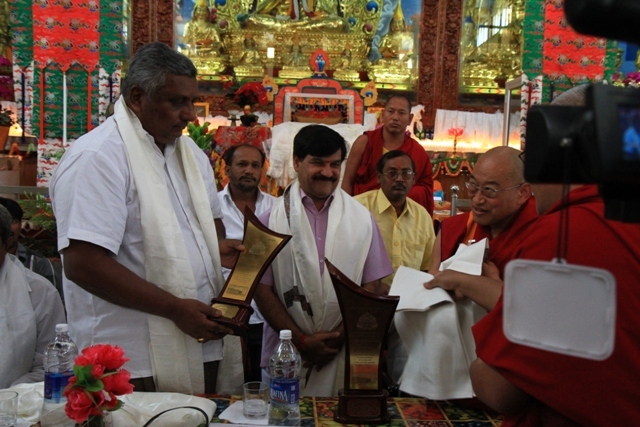 Their speeches were succeeded by an award presentation, where the Serpom Peace Awards were presented to Mr Venkatesh MLA. As we left Serpom in the strong heat of the Indian afternoon, we could not help but wonder – why is such an Enlightened, elite Buddha banned? How can Setrap, who is accepted by the mainstream monasteries like Gaden, enter the same person as Dorje Shugden, if Dorje Shugden is a spirit? More thoughts flew threw our minds. We had met so many compassionate, gentle lamas throughout our stay here…could it be possible that such high lamas and elite masters propitiated a spirit? 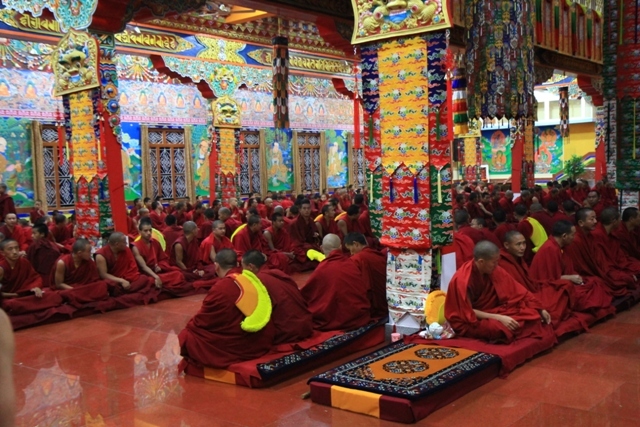 Why would so many high lamas, many of whom were previously promoted by the Tibetan government, fly from all around the world to attend this monastic opening? Why would a spirit help so many people over the years, and not ask for anything in return? We could not help but chuckle at these thoughts as we travelled down the bumpy Indian roads on our way home. May Dorje Shugden’s practice grow, we were so blessed to be there. This entry was posted on Thursday, January 26th, 2012 at 5:30 pm	and is filed under Articles. You can follow any responses to this entry through the RSS 2.0 feed. You can leave a response, or trackback from your own site. 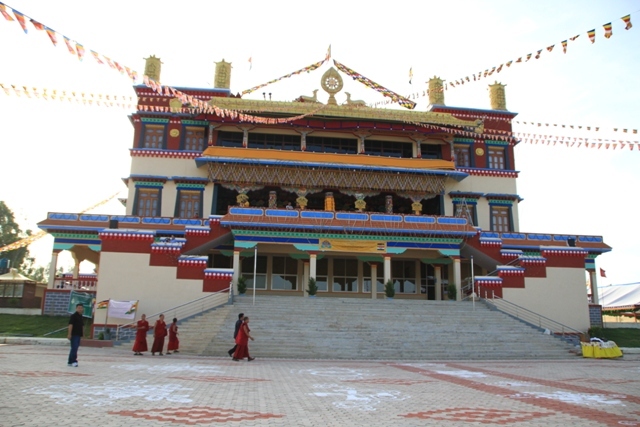 Through the opening of the Serpom Monastery, it acts as a testament showing the growth of Dorje Shugden practice. I believe that it was an honor to be able to see such amazing and unbelievable things happen right before the eyes of the attendees. 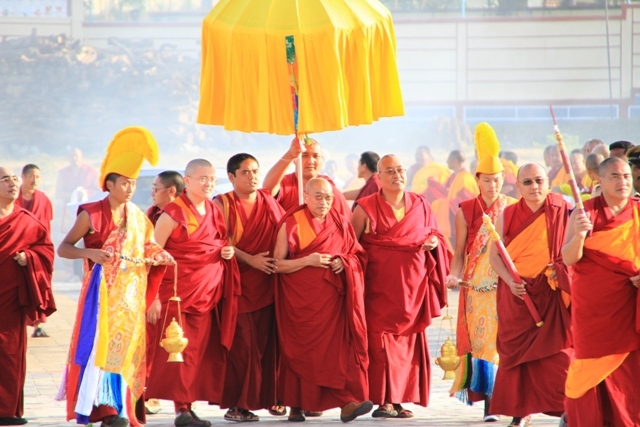 The opening is a great example of holding faith and Guru devotion. If the Gurus of the various monks had not given them this scared practice, they would not have practiced Dorje Shugden practices. 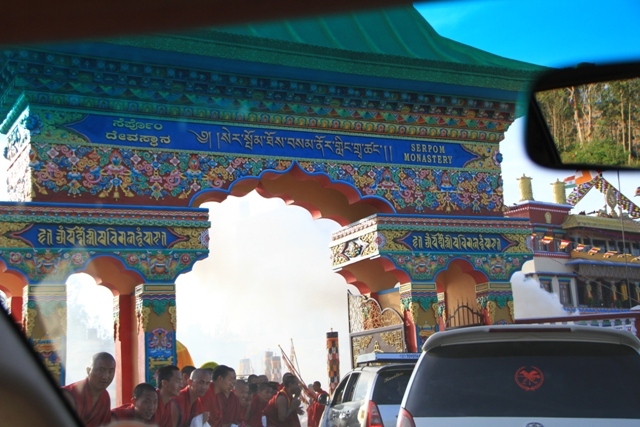 The monks had to have faith in the situation to be practicing Dorje Shugden practices in times like this with the ban going on. It is just heart warming to see that there are many that have benefited from Dorje Shugden practices, and also heart warming and happy to know that there is a monastery that practices Dorje Shugden practices to be opened during these time where the ban is still going on. It clearly shows the world that Dorje Shugden is not an evil spirit like what is being said. Instead, the ban might be something that is part of a bigger cause.